Cargo Trikes - 2nd Thoughts on Useful Tricycles. I've been keen to build a sleek recumbent trike for years now, but have not made any progress. Too much else on, and some doubts as to how much I would really use one if I was successful. When browsing around for fresh ideas I came across an interesting cargo trike at http://www.organicengines.com - a recumbent delta with a long wheelbase and the steering pivot behind the rider. This is much like the Jouta/Forelle designs, which by all accounts have stability problems at higher speeds. The Organic Engines SUV ("Sensible Utility Vehicle") claims great stability, and this seems to be confirmed by the electric assist variant you can find by googling for "solar gondola". You'll find some video of it in action. My guess is that the longer wheelbase of the "trailer" part is the key, removing all the twitchiness of a short wheelbase. I started dreaming about building something similar, and starting googling for more ideas on "cargo trikes". This led me to the home of Haley Trikes at http://www.haleytrikes.com. He makes conventional looking box trikes of the old ice-cream vendor style. His FAQ is especially interesting, and has videos of zipping around easily and quickly on these rather high and narrow trikes. 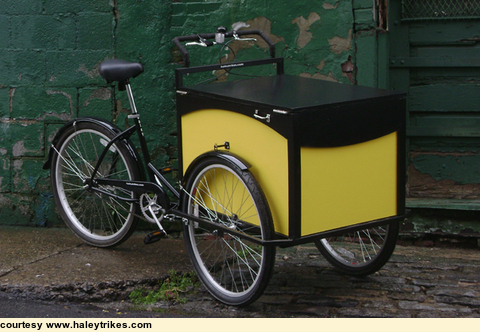 Here's a photo of a Haley trike, courtesy of Stephen Horcha of Haley Trikes. there are lots of these cargo trikes in use around the world, and have been for many decades - they can't be all that bad. apparently they are easier to pedal than might first appear, even with a load, as you can just stand up and pedal at a leisurely pace. You can't on a bicycle as you fall off at the low speed. this allows you to build up momentum gradually without over-strain. that same momentum helps you up the hills. with a back-pedal (coaster) brake for the rear wheel there's not a great need for so much concentration - just get on and ride, and enjoy it! hub gears help, and have the same worry-free ease of use. There'll be another web-page starting soon, but my plan is to cobble together the rear of a donor mountain bike with a light steel framed box and 2 x 26" MTB front wheels. I'll be using the MTB's derailleur gears for now, though it will be a challenge to work out the shifters and cables. If the result is promising I can think about buying a multi-speed hub gear (I live in a moderately hilly area). This might end up being my retirement transport for trips to the hardware shop, etc. We'll be a one car family before the year is out.